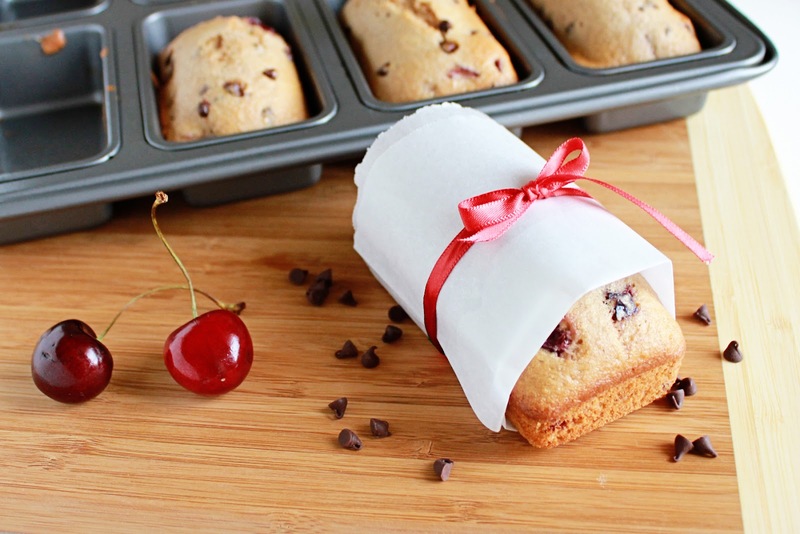 Bursting with fresh cherries and miniature chocolate chips, this chocolate cherry loaf is a sweet way to start your day. I absolutely love that cherries are in season right now – this is one of my favorite times of the year, I can’t seem to get enough of their fresh, sweet taste. Just yesterday I was thinking we needed some bread for breakfast and I immediately decided to include some cherries. What better pair for cherry than chocolate? Since my go to breakfast bread is banana, I wasn’t quite sure how much of everything to include, so I consulted my trusty 1,000 Lowfat Recipes book for guidelines. The closest thing to what I was going for was an Orange Cranberry Bread, so I scanned the ingredients, opened my fridge and adjusted accordingly. I set out to create a new family favorite and the result was moist, sweet and bursting with fresh cherry flavor. An added bonus is that it was an instant hit, even with my daughter. Morning, Noon or night, this bread makes a great breakfast or snack. This treat is a nice change from the regular; I hope you’ll enjoy, happy baking! Preheat your oven to 375º and prepare an 8 well mini loaf pan with baking spray (you can substitute a 9x4 loaf pan if necessary). In a large bowl beat together the eggs, brown sugar, milk, applesauce and vanilla. In a medium bowl whisk together the flours, sugar, flax meal baking powder and salt, incorporate the dry mixture into the wet until moist. Stir in the cherries and chocolate chips until combined, spoon the batter into the pan and bake for 18-20 minutes; until golden. Cool in the pan for 10 minutes, remove to a wire rack and finish cooling. They look so festive and so cute! Thanks Medeja – they were so good, we’ve already finished them off! Visiting from The Southern Institute… delicious! I’ve done banana chocolate chip but hadn’t thought of cherries before. What’s even better is that I buy combo dried mango/cherry throughout the year, but the kids always prefer the mango leaving a bunch of dried cherries. I know your recipe calls for fresh, but this could be a super easy substitution without leaving the house! Thanks! Perfectly gorgeous!!! I’d be snacking on these little beauties all day! That’s looks amazing!! LOVE the way you wrapped it!! Thanks for sharing this at The DIY Dreamer.. From Dream To Reality! Would love to invite you to my weekly link party over at The Purple Pumpkin Blog 🙂 Hope to see you there! Thanks for posting this at The Purple Pumpkin Blog Love the look of these so much – very cute! This looks amazing! Where did you buy that awesome pan? I love it!